Canada's Anglo-Celtic Connections: Are you dying to avoid winter? A lot of people in Canada do! 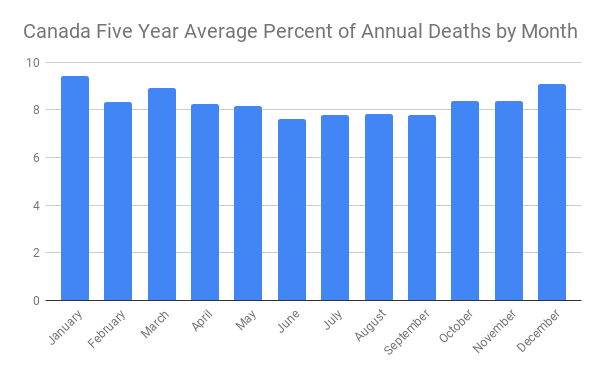 According to Statistics Canada on average 13% more people die in the winter (January - March) than summer (July-September). 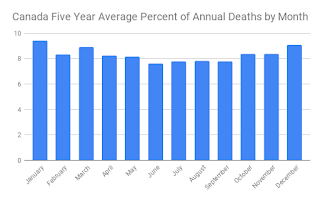 December vies with January as the most deadly month although February is more deadly on a deaths per day basis. This is one of the statistics publish by Stats Can today, a welcome example of the organization striving to release more timely information. Sadly the Yukon failed to provide all the information required for the compilation. Ontario government information was incomplete regarding cause of death.